^ a b c Skelton, R.A. (1979) . "Cabot, John". In Brown, George Williams (ed.). Dictionary of Canadian Biography. I (1000–1700) (online ed.). University of Toronto Press. ^ Skelton, R.A. (1979) . "Cabot, Sebastian". In Brown, George Williams (ed.). Dictionary of Canadian Biography. I (1000–1700) (online ed.). University of Toronto Press. ^ a b Jones, Evan T. (2008). 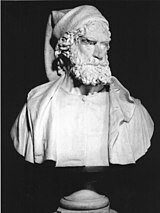 "Alwyn Ruddock: John Cabot and the Discovery of America". Historical Research. 2007 (212): 237–40. doi:10.1111/j.1468-2281.2007.00422.x. Archived from the original on 11 July 2011. ^ di Alberto Magnaghi. "CABOTO, Giovanni e Sebastiano in "Enciclopedia Italiana"". Treccani.it. Retrieved 6 March 2017. Bonavista is a town on the Bonavista Peninsula, Newfoundland in the Canadian province of Newfoundland and Labrador. Unlike many Newfoundland coastal settlements, Bonavista was built on an open plain, not in a steep cove, and thus had room to expand to its current area of 31.5 square kilometres. 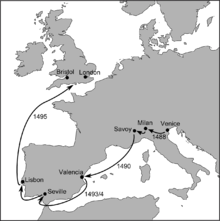 The Cantino planisphere or Cantino world map is the earliest surviving map showing Portuguese geographic discoveries in the east and west. 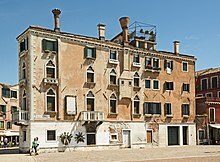 It is named after Alberto Cantino, an agent for the Duke of Ferrara, who successfully smuggled it from Portugal to Italy in 1502. The map is particularly notable for portraying a fragmentary record of the Brazilian coast, which the Portuguese explorer Pedro Álvares Cabral explored in 1500, and for depicting the African coast of the Atlantic and Indian Oceans with a remarkable accuracy and detail. It was valuable at the beginning of the sixteenth century because it showed detailed and up-to-date strategic information in a time when geographic knowledge of the world was growing at a fast pace. It contains unique historical information about the maritime exploration and the evolution of nautical cartography. The Cantino planisphere is the earliest extant nautical chart where places are depicted according to their astronomically observed latitudes. Bristol is a city with a population of nearly half a million people in south west England, situated between Somerset and Gloucestershire on the tidal River Avon. It has been among the country's largest and most economically and culturally important cities for eight centuries. The Bristol area has been settled since the Stone Age and there is evidence of Roman occupation. A mint was established in the Saxon burgh of Brycgstow by the 10th century and the town rose to prominence in the Norman era, gaining a charter and county status in 1373. The change in the form of the name 'Bristol' is due to the local pronunciation of 'ow' as 'ol'. 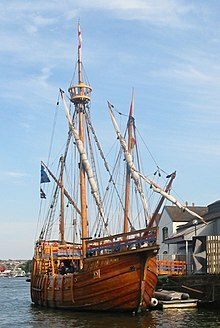 The Matthew is a replica of a caravel sailed by John Cabot in 1497 from Bristol to North America, presumably Newfoundland. 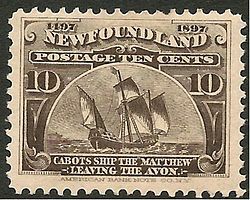 After a voyage which had got no further than Iceland, Cabot left again with only one vessel, the Matthew, a small ship, but fast and able. The crew consisted of only 18 men. 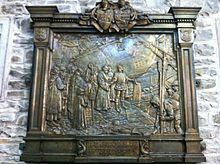 The Matthew departed either 2 May or 20 May 1497. 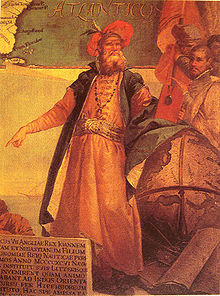 He sailed to Dursey Head, Ireland, from where he sailed due west, expecting to reach Asia. 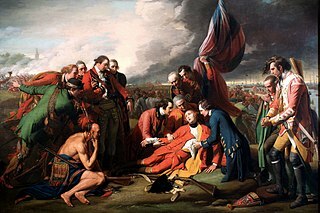 However, landfall was reached in North America on 24 June 1497. 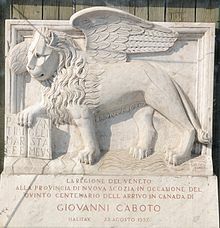 His precise landing place is a matter of much controversy, with Cape Bonavista or St. John's in Newfoundland the most likely sites. 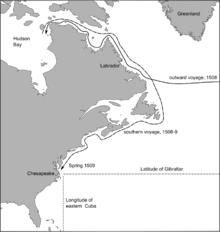 Carbonear is a town in the Avalon Peninsula in Newfoundland and Labrador, Canada. It overlooks the west side of Conception Bay and had a history long tied to fishing and shipbuilding. Since the late 20th century, its economy has changed to emphasize education, health care and retail. As of 2016, there were 4,838 people in the community.